Factory farms and industrial slaughterhouses will continue to try to find ways to hide their practices and protect their profits. With your continued support, the Animal Legal Defense Fund will anticipate and counter their every step, bearing witness and sharing what we see with judges, legislators, litigators and you, as we work to eliminate so much unnecessary suffering. Farmed animals in the U.S. receive virtually no protection under federal law except for regulations of the way they are transported and slaughtered. Despite the last few decades’ slow expansion of legal protections for companion animals and, to a lesser degree, animals used in entertainment, no federal laws have been enacted to protect farmed animals when it comes to the way they are raised. Moreover, most state laws exempt otherwise cruel standard agricultural practices from state cruelty laws, essentially making farmed animals beyond—or beneath—the law. In late April, the Animal Legal Defense Fund filed a complaint with the Illinois Attorney General regarding violations of the Illinois Consumer Fraud Act recorded on video at a pig-breeding facility own and operated by The Maschhoffs, LLC. The Animal Legal Defense Fund complained that the company engaged in unfair business practices due to the apparent animal neglect caused by a failure to feed and provide proper veterinary care to animals. The Animal Legal Defense Fund’s complaint also alleged that the company engaged in deceptive business practices because the conditions at the facility conflicted with the company’s own advertising that it is committed to “humane animal handling” and providing the “best possible environment” for the animals. 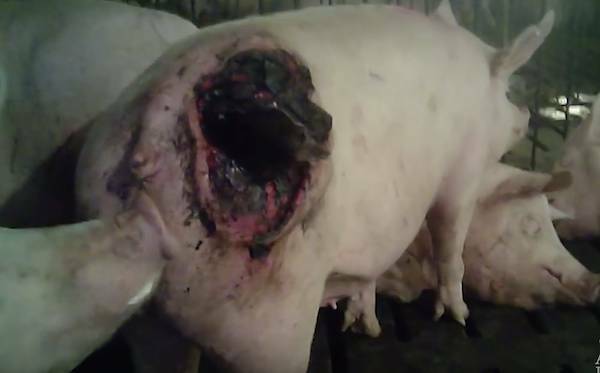 Watch undercover video: Investigation Reveals Cruelty and Neglect at Hormel Foods’ Pig Supplier on youtube. In the video, The Maschhoffs employees can be seen slamming piglets against the ground. 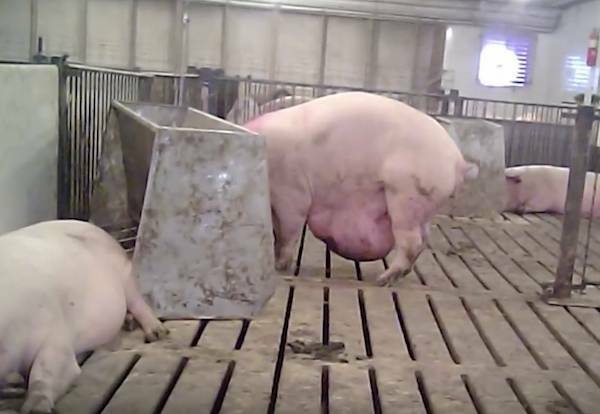 Adult mother pigs are shown writhing in farrowing and breeding crates, constructed to maximize per-square-foot profit and so small as to prevent pigs from being able to turn around, much less stretch their muscles or roam to satisfy natural instincts. Confinement is intense, and when workers fail to move pregnant pigs to farrowing crates in time, piglets are crushed to death by mother pigs with no room to move and no natural bedding material to make a proper nest. Pigs obviously anxious with hunger can be seen jostling empty food bins and employees converse about malfunctions with the feeding systems. None of this was surprising to our investigators, or to us. In an industry that slaughters well over 100 million pigs in the U.S. every year, these dead piglets and sick, dying mother pigs are simply considered breakage or shrinkage if not “collateral damage.” To an industry that can move lame animals into position for slaughter using electric prods, the sight of empty food troughs is unlikely to evoke empathy and spur changes from within. Even the last few moments of an animal’s life that might be granted some humane protection by federal law are under attack, as the U.S. Department of Agriculture has been decreasing its slaughterhouse inspector workforce and shifting those responsibilities to the animal product producers themselves, as absurd as that may sound. And all of this is taking place in an environment where at least seven states have enacted “Ag-Gag laws” that seek to punish would-be whistleblowers and undercover activists for recording and sharing footage like that taken at The Maschhoffs facility. We’re doing battle to keep such laws from spreading. In August 2015, an Animal Legal Defense Fund-led coalition of animal, environmental and civil rights organizations scored a first victory against an Ag-Gag law when a federal district court in Idaho declared the law unconstitutional under the First and Fourteenth Amendment. Similar suits are now pending against the states of Utah, Wyoming and North Carolina.